An alignment angle doesn’t change randomly. There is a cause-and-effect relationship between external and internal forces that can alter the geometry of a vehicle’s suspension. Having the alignment reading for only one angle on one corner is just like knowing the temperature without knowing if there is a tornado outside. Just making adjustments and not asking why the adjustments were needed can lead to a comeback. 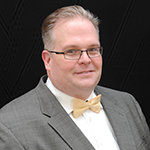 Knowing why the adjustment is required is critical to performing the total alignment. Loads in the rear of the vehicle can cause changes to caster and camber. The camber and caster will become positive in the front, and if the vehicle has an independent rear suspension, the camber will become negative and it will be toed out. This could lead to outside edge wear in the front and inside edge wear in the rear. If you are dealing with a heavy driver, it is possible that the springs will compress on the left side of the vehicle and it changes the toe and camber angles. In some cases, this can cause inner edge tire wear. It is possible to align the vehicle with the large customer in the driver’s seat to set the correct amount of toe. As a suspension compresses and rebounds, the alignment angles change. Engineers tune alignment angles for a specific ride height to maximize handling and tire wear. 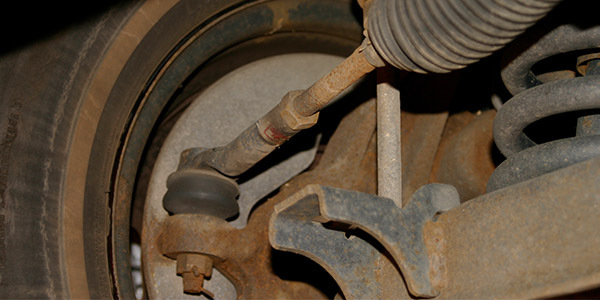 If a spring can no longer support the vehicle, the alignment angles will suffer. Springs are made of heat treated metal, but they can still fatigue. This includes leaf, coil and torsion bar springs. Even under normal conditions on a smooth road, a spring can cycle an average of 1,750 times for every mile traveled. If you see a vehicle that needs considerable adjustments for camber on both wheels of the same axle, inspect the springs. Rubber bushings are designed to insulate the chassis against road vibration and noise. Ozone, extreme temperatures and other atmospheric issues tend to harden rubber bushings and cause them to transmit noise and vibration. Even worse, worn suspension bushings can cause excessive tire wear because they can’t maintain accurate toe angles during braking and acceleration. Many late-model vehicles include hydraulic bushings on the control arms, with chambers passing fluid at different rates depending on the movement of the suspension. Some bushings will leak when they fail, while others won’t leak as the damage will be internal. 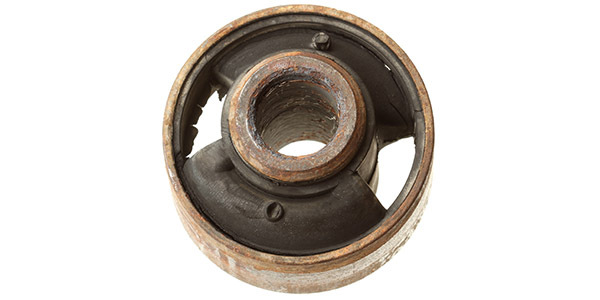 Symptoms of a damaged bushing include a rattling noise coming from the front of the vehicle while driving at slow speeds. A bent control arm will change toe and camber alignment. Misalignment of these angles can scrub the rubber off a set of tires as fast as any lead-footed teenager. Only 1/8 inch of toe misalignment can produce scrub that’s equivalent to dragging the tire sideways 28 feet for every mile that’s traveled! So, if you see a feathered wear pattern on the tires or what looks like camber wear on the inside or outside shoulders of both front tires (radials primarily), the toe is probably out of alignment. More and more automakers are offering all-wheel-drive on vehicles from small SUVs to compact sedans. The differential and suspension components on these vehicles are mounted on a cradle that may only connect to the uni-body in four to six locations. When aligning these types of vehicles, pay attention to wheel setback and thrust angle. These diagnostic angles can help you determine if the cradle or suspension components are damaged. Most thrust angle problems on these suspensions can be resolved with toe adjustments, but if the cradle has shifted, you may quickly run out of adjustment on the toe links and cause a bump steer condition. Have you ever noticed a vehicle with one wheel that has a buildup of brake dust? It could be the thrust angle. The excess dust can occur on all vehicles with stability control, no matter the type of suspension design. The thrust angle is an imaginary line drawn perpendicular to the rear axle’s centerline. This measurement compares the direction that the rear axle is aimed with the centerline of the vehicle. It also confirms if the rear axle is parallel to its front axle, and that the wheelbase on both sides is the same. To the customer, an off-thrust angle will mean an off-center steering wheel. To a stability control system, the increased steering angle and changes in yaw sensor readings could be seen as understeer. To correct the imaginary push, the ESC system will pulse the brakes for one wheel in the rear to try to correct the direction of travel. The customer may notice a momentary pull. You may notice a buildup of brake dust.